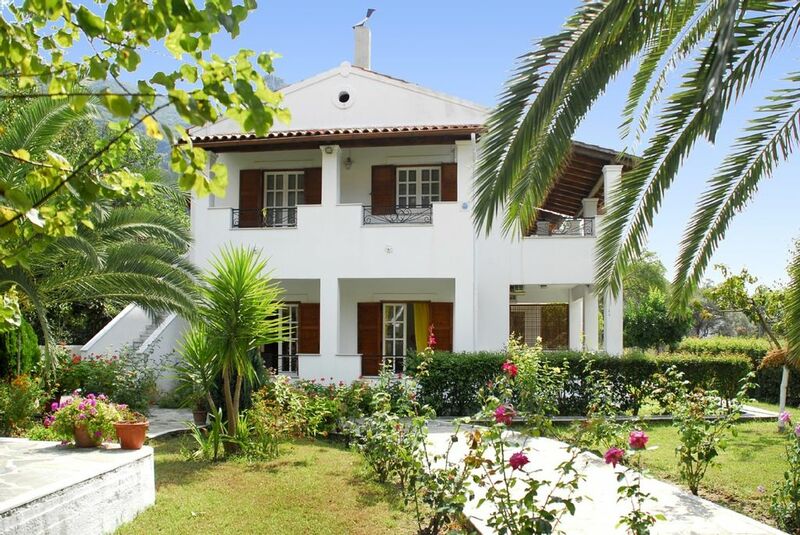 Lovely apartment in Agios Gordis on the West Coast of Corfu. This two bedroom, ground floor, apartment is very comfortable and set in its own garden that is abundant with beautiful plants and fruit trees. There is a large shaded and furnished terrace making this accommodation all about the outdoors. Each bedroom has 2 single beds and share one shower room/WC. There is modern fitted kitchen combined with the dining and sitting area where there is also a sofa bed that sleeps 1, making this apartment suitable for up to 5 people. 5th bed available at 5 Euros per night. Free WIFI. Maid and linen service included. Taxi transfer rates available on request. Car hire rates available on request. Not suitable for wheelchair bound as bathrooms doorways may not be wide enough for a wheel chair. But on flat level, no steps so suited for people with limited mobility. Stavroula is a ground floor, spacious apartment with an open-plan kitchen, perfectly equipped for a family seaside holiday. Quiet location but still close to all amenities and very close to the sandy beach. Air-conditioning available for a small daily supplement which is paid locally to the owner. A well presented, basic apartment, located 4 minutes from the beach. Situated close to shops, restaurants and bars. Equipped with most things that you would need for an enjoyable stay in this delightful village. Parking is difficult, as there is none closeby, this is located some distance from the apartment, but this is not too much of a problem for the more able. An excellent location very near the beach, bars, restaurants, shops and the bus stop. Lovely clean and well kept apartment, cleaner very friendly she does not speak much english but with an English/Greek Dictionary and signs can communicate. She made special cakes for us we called cornish pasties they were excellent. Would recomend this property we were there in September and very quiet but still very warm. Trip on bus to Corfu Town is a must very cheap, the narrow streets were interesting, watching cricket on the green and a short trip to the Duke of Edinburghs Birtplace was good. Wasps were a slight irritant but just get greek coffee set it alight in a cup or container and the wasps scatter can be used on beach, restaurants use it, or just eat at night. Das Haus ist in der Nähe von einem schönen Strand, der Ende Juli nicht überlaufen war. Man kann von dem Ort Agios Gordis schöne Ausflüge unternehmen, am besten hat uns die organisierte Tour nach Albanien gefallen. Das Haus liegt in der zweiten Reihe hinter der Hauptstrasse, die zwar klein und eher ruhig ist, es befinden sich aber Bars und Restaurants auf dieser Hauptstraße. Die Bar hört man spätabends schon. Muss man einfach wissen. Es wäre toll, wenn überall Mückengitter wären, die Mücken sind ein Problem. Wir haben verschiedene Schuttzzmaßnahmen ergriffen, wie abends auf die Jagt gehen, Autan benutzen und Anti-Mücken Stecker in die Steckdosen stecken. In der Wohnung ist alles für den täglichen Bedarf vorhanden, alle drei Tage kam jemand zum Saubermachen, die Bettwäsche und Handtüchr wurden gewechselt, es war sehr sauber und gepflegt. Die Zimmer sind wie neu, die Betten auch. Diese sind sehr bequem. Alles super, nette Putzfrau, nette Vermieter, super Service! Gerne wieder kann man nur empfehlen. Thank you so much for your kind review. We are pleased you enjoyed your stay at Stavroula apartment and look forward to seeing you again in the near future! We hadden een plek op het strand bij Dandidis waar we regelmatig een strandstoel met parasol huurde. De verhuurder was stille ingetogen man, na een paar dagen herkende hij ons en groette ons met een klein knikje. Het eten en drinken was daar erg lekker voor lage prijzen. Het zand was zo heet ,maar geen probleem voor de ober van Dandidis. The beach of Agios Gordis is undoubtedly one of the most picturesque on the west coast of Corfu. The big sweeping sandy bay has something to offer everyone. Safe swimming makes it family friendly whilst the centre of the beach has enough activities to occupy the most active and the south end offers a quiet corner to rest. An eclectic mixture of shops and restaurants backs the beach whilst the sea front has many cafes and tavernas to relax in and enjoy the local culinary treats. The pedestrian lane ways that wind away from the beach have a scattering of apartments, studios and houses set within their own neat gardens. The beach is never more than 5 minutes walk away. There is a regular bus service to Corfu Town.